This dessert is included in Death Knock and is one of my favorites because it’s scrumptious and a cinch to make. I came up with the recipe after watching many cooking shows and reading countless recipes. It’s a mix of several ideas that really come together well. This could also be prepared using a springform pan with your own crust and lemon curd. Topping it off with homemade whipped cream makes it beautiful and delicious. Either way you fix it, the taste is tart and fresh. I hope you and your guests enjoy it as much as my family and friends always do. Pour the contents of one of the jars of lemon curd into a bowl. Stir until soft and well blended. Then spread into a layer over the pie crust. Pour the other jar of curd into the same bowl and stir again until well blended. Add one half of the tub of Cool Whip into the bowl and then stir carefully so the whipped cream doesn’t break down. When it is blended , pour onto the layer of lemon curd. Layer the remaining Cool Whip on the top. Finally zest the lime and sprinkle for decoration. Refrigerate for at least two hours. *Lemon curd can be found in the jam/jelly or the baking section of most grocery stores. 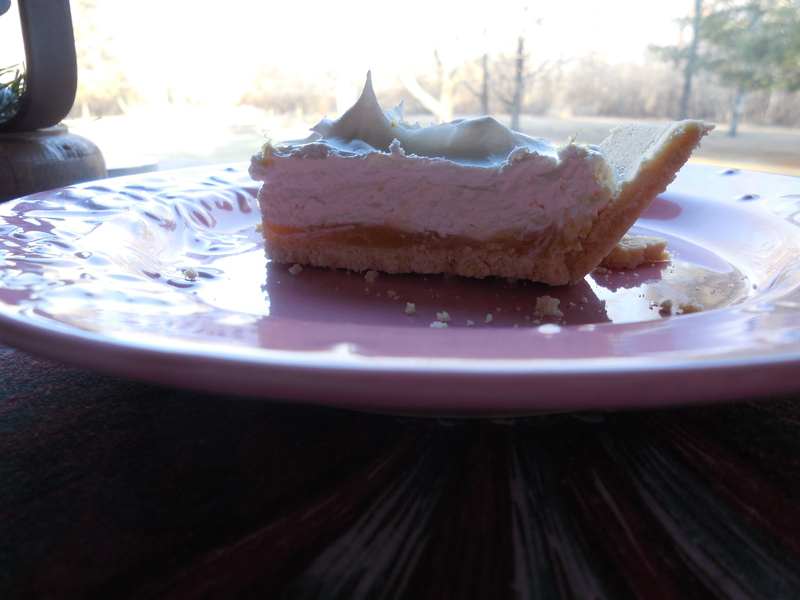 This entry was posted in Recipes, Uncategorized and tagged Death Knock, Lemon Dessert, Noshes Up North Series on February 18, 2015 by MaryGrace. Here and there in the book, Nell prepared delicious dishes. But she only generalized amounts of ingredients. 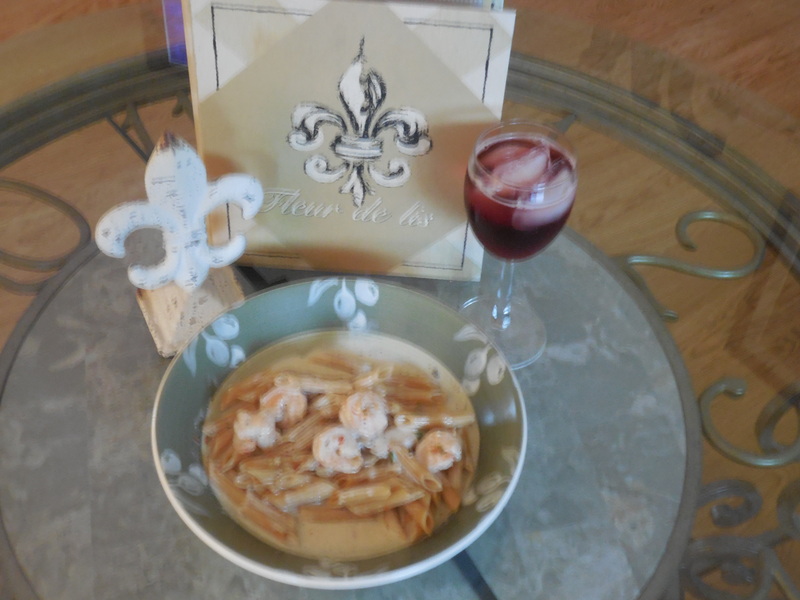 Several readers have asked for the recipes to be included in the next book and specifically inquired about Spicy Shrimp Pasta. I’ve written it here. I hope you give it a try. It’s one of my favorites. Put the first eight ingredients on a plate and set aside. 1. Cook the pasta in a large pot of boiling water until al dente. 2. Saute the shrimp in garlic in a large skillet about two minutes per side. Remove from heat. 3. Cook cream/half and half in the shrimp skillet over medium heating, stirring constantly. When it looks like it is almost ready to boil, reduce heat, and add the items from the plate. Simmer until thickened, about 8 minutes. 4. Stir in the shrimp and cheese at the end, so the shrimp doesn’t become tough and the cheese doesn’t curdle. Be sure and blend well. ***The last time I made this, I had a lot of sauce left over. I had some leftover quinoa and mixed it into the sauce. It made a thick and rich soup. This entry was posted in Recipes, Uncategorized on May 8, 2014 by MaryGrace. I’m soon coming off the low carb kick start of my diet and one of the last items I wanted to prepare was deviled eggs. 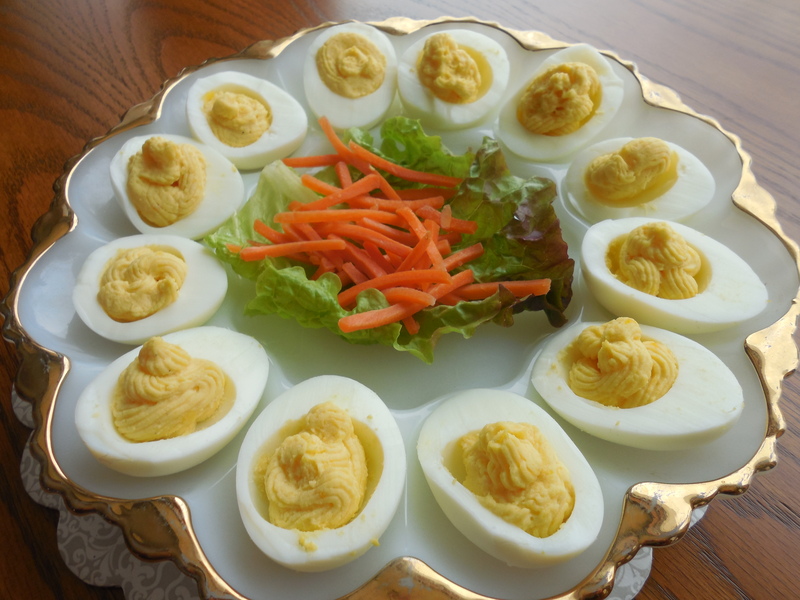 I mix the yolks with a blend of equal parts mayo and horseradish sauce. I add a pinch of curry and a couple drops of hot sauce. Then I taste and add more ingredients accordingly. This was the first time I put the filling in a pastry bag with a decorator tip to finish the eggs. (I need practice.) I also forgot to put paprika on top. Must have been nervous in front of my own camera. Delicious with a snappy bite! This entry was posted in Recipes and tagged Recipe on January 21, 2014 by MaryGrace. 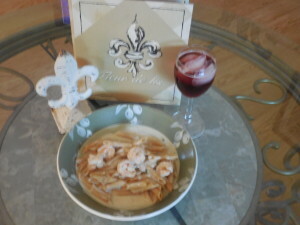 This is a recipe that I mentioned in Death Nell without the instructions to make it. It was my sister’s and my favorite dip when we were young. When I eat it now, good memories come back and it tastes like love on a chip. I’ll give you the original and how I’ve changed it to make it more to my liking now. Stir together and eat with potato chips or crackers. Change the amounts of dressing, onion, and garlic to suit your taste. Now I use one clove real chopped garlic and some chives in addition to the chopped onion. In my fridge, I always have a can of chipotle peppers in adobo sauce that I’ve chopped into a thick sauce in my hand blender or food processor. I use that as a spicy flavoring in many of my recipes. For this dip, I start with a teaspoon and add from there. Taste as you go. You no longer need the Western dressing if you use the pepper sauce. 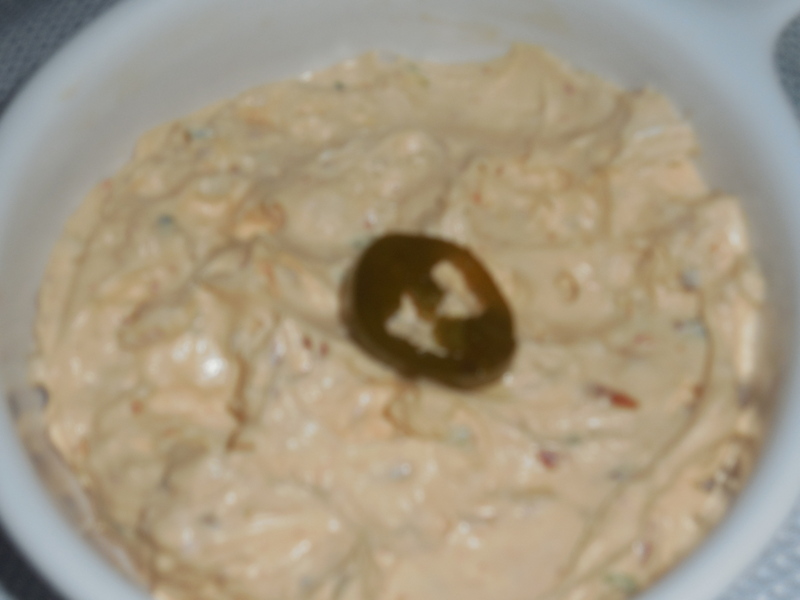 A simpler way would be to still use the dressing, but just put in a few shakes of chipotle ground red pepper. I add more pepper than this, but I like spice. Sometimes now I’ll add 1/2 cup of sour cream to the cream cheese. To decorate it, you can add a slice of jalapeno pepper or a few slices of green olive. Enjoy this fast, easy recipe. This entry was posted in Recipes and tagged Recipe on January 9, 2014 by MaryGrace.